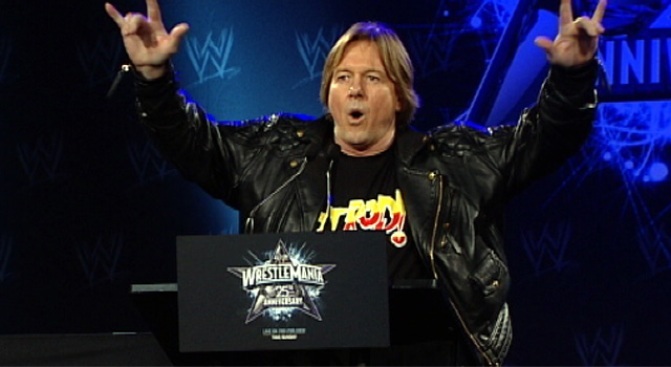 "Rowdy" Roddy Piper shows off his cool look in front of New York media on Tuesday. WrestleMania will celebrate its 25th annual event in front of thousands of adoring, screaming fans in Houston Sunday, but the WWE heavies kicked off the big week Tuesday by coming back to where it all started. Past legends "Rowdy" Roddy Piper and Ric "Nature Boy" Flair joined current WWE star Chris Jericho and others at a news conference at Hard Rock Cafe in New York City's Times Square. The first WrestleMania took place at Madison Square Garden. Who could forget King Kong Bundy devouring SD Jones in nine seconds? Or the $15,000 cash prize Andre the Giant won for defeating Big John Studd? Gone are the Superfly Snukas and the Precious Paul Ellerings of the sport. The names have changed, but the acting exciting wrestling remains the same, as does the pay-per-view availability for what the sport bills as "The Greatest Spectacle." WrestleMania XXV goes down at Houston's Reliant Stadium at 7 p.m. ET Sunday.